Apple Forecasted to Report Record Earnings Next Week, but Will iPhone 8 Keep Driving Growth? Barclays estimates that Apple will report a record-breaking $76.6 billion in revenue when it announces its earnings results for the first quarter of fiscal 2017 on January 31. Apple reported revenue of $75.9 billion in the year-ago quarter, and offers guidance of $76 billion to $78 billion for this quarter. UBS estimates Apple will report revenue of $77.8 billion next week, which falls on the higher end of Apple's guidance. UBS analyst Steven Milunovich maintained a "buy" rating for Apple stock with a target price of $127—compared to $120 currently—in a research noted issued to investors today. Meanwhile, Barclays analyst Mark Moskowitz lowered his price target for Apple's stock from $119 to $117 in a research note issued to investors today. Moskowitz does not expect "meaningful upside potential" for Apple in 2017. He believes customers increasingly "mixing down" by opting for the iPhone 6s in favor of the iPhone 7 could weigh on Apple, while he is also concerned about China and India failing to emerge as growth catalysts in the next 12 months. He said the so-called "iPhone 8" will potentially have "no must-have advanced features," making him skeptical of a meaningful growth rebound for Apple in the second half of this year. He added that smartphones have become "more than good enough" to serve the needs of most users over multiple years or until the device breaks. While not likely to have a similar replacement cycle of PCs (i.e., 5-7 years), we think the smartphone market and thereby the iPhone franchise stand to face incremental headwinds this year and next, as the smartphone useful life extends to 3 to 4 years from 2 to 3 years previously. As a result, the prospect of revolutionary technology incorporated into the next iPhone (iPhone 8) is not likely to counter the expanding useful life of smartphones in general. Specifically, he said OLED display options, bezel or bezel-less designs, an embedded Home button, and wireless charging are commonly mentioned in its discussions with industry participants about the next iPhone, but that the new features might not be able to reassert that "must have" element for customers. Wireless charging in particular may be limited by the need to be close to a charging base. Moskowitz does not expect wireless charging over greater distances to develop until 2018-2019 at the earliest. He acknowledges that Apple could be making strides in this space by partnering with firms like Energous, but he maintains his view. Nevertheless, he said Apple has a "sticky ecosystem" and a large cash balance that provide decent support for long-term investors. Barclays predicted Apple has long-term growth opportunities related to India, its growing services category, the enterprise market, artificial intelligence, and possibly the cloud, but it does not expect those potential "what's next?" opportunities to emerge as "major needle movers" for the company over the next 12 months. The iPhone 8 will simply blow past the most optimistic estimates. 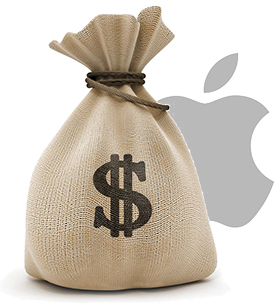 Apple is severely undervalued, that's why BlackRock raised their already huge stake in the company. One year from now, people will be wondering why the hell they didn't buck up the truck at this unbelievable valuation. Apple wants long-term growth opportunities, then don't upset your customers by not updating desktop Macs. Thanks Tim. You have great things coming down the pipeline right? iPhone 8, unless it has a Samsung battery level flaw, will keep Apple's profits stable. If it gets good press and reviews it will grow profits. Laptop and Desktop computers aren't enough of Apples income that by ignoring them for another year will significantly impact profit. It will continue to alienate some of Apples longstanding fans however, and will probably require some actual response, whether that means actually updating the line or selling it off. The success of updating or selling depends on how significant the update is or how competent the company that buys the line is. But none of these possibilities will happen this year with computers. Sadly the iPhone is Apple's only focus now, it's fast becoming a one trick pony. The only thing I find impressive with what apple has been doing the past year is how they are able to still rake in so much money. It would not surprise me to see Apple spin off its laptop/desktop business into a separate company. I think customers would actually benefit from this. Apple will have a very hard time growing this business while maintaining its same margins on its other lines of business. Plus, operating as a separate company would mean it wouldn't have to sell hundreds of millions of units. So it could do small runs of 17" laptops of Mac Pros. As far as I'm concerned, I already know the iPhone 8 will be a must buy. And everyone I talk to says the same - they cannot wait to get their hands on the new iPhones as soon as they launch. Yes, but i am afraid that all the rumors are not for the 2017 iphones, but later models. We' ll probably get an iphone pro this year, with perhaps a clickable lower chin/bezel that acts as an homebutton and all of the lower bezel part could be a fingerprint reader, and we' ll get a curved oled display. It will have a glass back and front with stainless steel frame sandwiched in between. It will have inductive but not wireless capabilities. It will be an apple s7/note 7 basically, nothing really new, just the design with better specs. Nothing ground braking... and they' ll cost a ton, be limited in availability. I feel a bit of dissappointment coming in september. iPads are the future of mobile computing, not Macs. Not for the software I need to run which is not avalable on iOS. They may be the future for a lot of people but nothing beats a laptop for a lot of people too. i.e. people are different and have different needs, for example, I need a cursor, proper keyboard and screen real estate to get my work done. So much money and such a trashy computer lineup.